Note from Pastor Kevin Lea: The Bible teaches us that Jesus is to be our priest (Psalm 110 with the book of Hebrews), that our devotion is to be toward the Son (Psalm 2 and John 14:6) and not his mother (Acts – Revelation). The Pope is leading a billion deceived Catholics into the same Queen of Heaven idol worship that ended up bringing the judgment of God upon the Jewish people (Jeremiah 7 and 44). If we love our Catholic friends, we will warn them to: repent of Mary worship/adoration, leave the false teachings of the Pope and the Catholic Church, and come to biblical saving faith in the biblical Jesus. 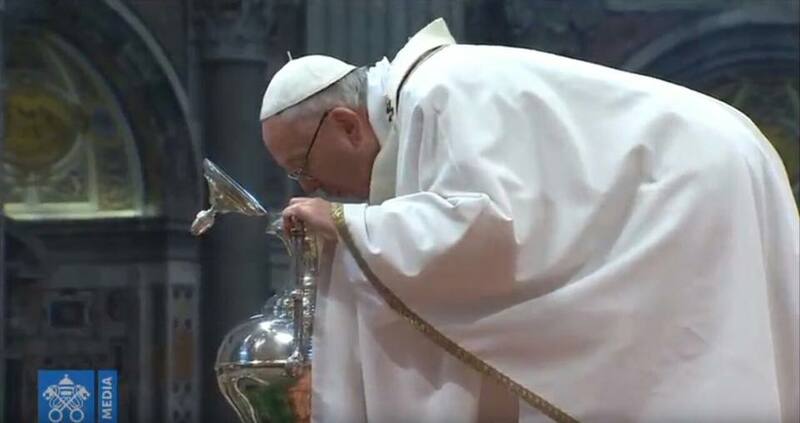 Mary, with her ‘yes’ to welcoming her Son into the world, is the one who brought us close to Jesus forever, Pope Francis underscored during the Chrism Mass in St. Peter’s Basilica this Holy Thursday morning [day before Good Friday].